Here is a link for all permitted Texas Rehabbers, from the Texas Parks and Wildlife. Island Rehabber posted this link in another thread and it's just too good not to add in this area. This link allows you to locate rehabbers in your "Country", "Providence/State", and "Town". It's awesome! Thanks Island Rehabber! That link is part of the International Wildlife Rehabilitation Council (IWRC, home page www.iwrc-online.org). There is also a USA-only National Wildlife Rehablitation Association (NWRA) and their website is www.nwrawildlife.org -- very helpful info there as well. Happy to help! Is it just me or does the first post of a "complete" list only have states up to M??? heather, under the last listing for Montana you will see a link that says to go to the N-W states, click on that, hope this helps. 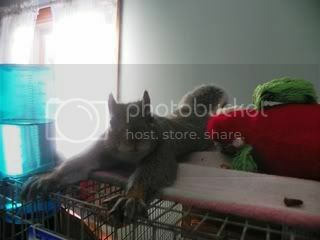 I need a vet for my squirrels in Toronto Canada area. I don't need a rehaber I just want a vet that will see them if and when I need them. I am afraid that they either won't see them or if they do they will confinscate them. I have two squirrels that are unreleasable. They live a happy life. One is half blind and the other is a little weak in the back legs. they are not in pain. I just want to know of a vet for preventative reasons. Just in case I need them down the road. I don't want to wait until the last second to find one. For North Carolinia please visit this URL for Rehab info. I can not get the A-M list to work right. It will show me the first three A listings but will not show me any thing else. The N-Z work just fine for me. I live in Florida and would like to see the list just in case I ever need it. Try searching here... If you don't find one, please let us know. Thanks. I found only one, but then that's all it takes. I talked to her about 4 years ago, but it was about baby opossums someone found. I had lost her number and had not thought about her at all. I cant get the list to work for missouri either list nothing comes up for me. I live in blue springs missouri would like to find a rehabber to talk to about a few things on soft release or have them release my little one i really think she would be much better out there making her own little family than being cooped up in her cage i do let her out quite often but it just doesnt seem fair to her she is a sweet girl. i just worry about the time right now it being so close to really cold weather and all the other squirrels in our area have already gathered most of the acorns and stuff maybe waiting for spring is best now. If they are not near you they will have a list of every rehabber in the state and can point you in the right direction. I've contacted them in the past and Bob Sallinger has told me they would euthanize (sp?) them as they are not native to Oregon. I doubt if anyone named "Sallinger" is any kind of "native to Oregon" either. Doesn't sound like a Native American name to me.......perhaps we could euthanize him too. Jolene -- in case you look back here, GammasBaby has moved your post to Emergency so it will get faster attention -- click here: http://thesquirrelboard.com/forums/s...d=1#post254728 and post any questions or updates there instead. It is wonderful to finally see easily accessable lists for rehabbers around our Country. I would like to add a note of caution to a members, to FIRST check with any rehabber listed here, you are not familiar with, to see if they practice euthanasia, and under what conditions that is done. Also, for those who live in our Pacific Coastal States, to ask a rehabber FIRST, if they willing to care for a Non Native Species of tree squirrel, and release it back to the wild, where it was found, or to you, if only willing to rehab it. I have the membership directory for NWRA (National Wildlife Rehabilitators Association). This includes rehabbers from all 50 states including Canada. British Columbia,New Brunswick, Nova Scotia, Ontario,Quebec. Mexico, and overseas! surely someone here already has this! But if needed I can look up an area for any trying to find a rehabber in their area. "Until one has loved an animal, part of their soul remains unawakened!"